Ezra was four months old Tuesday and is continuing to learn new things everyday (or week - since this is Week in Review). 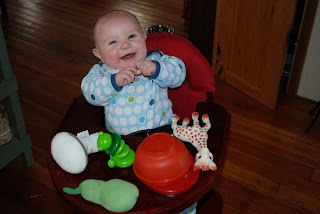 Since he has been sitting up on his own we decided to introduce him to his Svan high chair. Though initially reluctant and skeptical of this unfamiliar piece of furniture, he soon discovered how fun it is to sit independently and play with his plush fruits and vegetables, Sophie the Giraffe, or his favorite toy – a Tupperware bowl. This new development has made mornings even more fun. Rather than lying in his playard while we get ready, Ezra now sits in his chair and plays with his toys, listens to music, and watches us as we go through our morning routine. So what has Ezra been listening to in the morning? 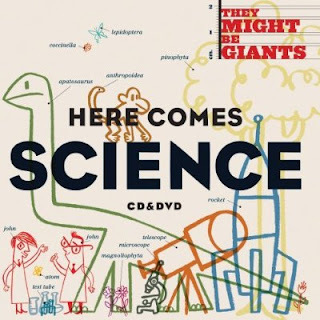 The same album that has been in heavy rotation at our household: Here Comes Science by They Might Be Giants. It rocks! Check out the title tune, “Science is Real.” It was our anthem for Darwin Day on February 12th. Friday ended with an appointment at the pediatrician’s office. Ezra weighs 15 lbs., 14 oz. and is 23.5 in. long. His measurements are more than a tad disproportionate - he’s in the 75th percentile for weight, between the 5th and 10th percentiles for height. He’s a healthy breastfed boy! 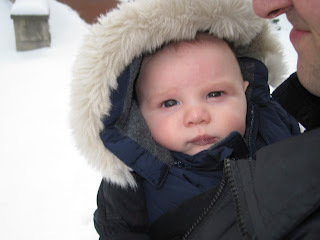 In the aftermath of his vaccinations, Ezra had his worst day ever! But, he felt much better by Saturday afternoon. We went into Bloomington and spent some time at the frame shop, visited a couple galleries on the courthouse square, and walked at Flatwoods Park. The word of the week was: SNOW! As always, follow Postilius' photos and videos on YouTube and Picasa. Want to know more about our week? Follow us on Twitter too!